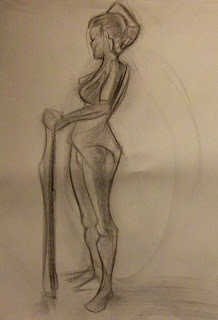 ...We got to do some tonal in life drawing recently. I have come to the realization that I definitely should use a hard charcoal next time, rather than grease pencil. Ah well, I still got one that I didn't mind. I tried a experimenting with style also. Tell me what you think of it.